of this week Welcome to our referral reward point system that we have launched to say thanks for spreading the word. Now, whenever you invite your friends, family and coworkers to WTH, you’ll earn points that you can use towards Premium subscriptions, cash back and more. Once joined, you can keep on accumulating points through contribution, engagement, reference and doing promotional activities. As a member, you can earn lot more points by doing the following activities. Need more points? Invite your friends to earn referral bonus. Check out the details below. 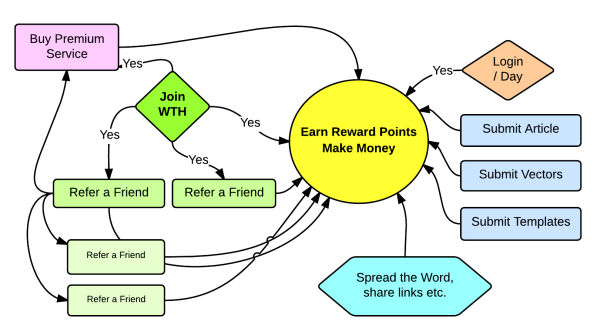 If you refer users to join WTH you will earn referral bonus points. Inviting your friends to WTH is easy. Login to your account to go to your profile details to grab the referral link. Then, invite friends via email, Facebook, Twitter, or by copying and pasting your unique referral link anywhere your friends will see it. You’ll receive Referral Points when your friends sign up through your link. Bonus: As an added advantage, just for signing up through your link, your friends and colleagues will get more points as joining bonus compared to if they join without any reference. 2.1 - How can I Earn Referral Points? We offer you up to 50 points for each member you refer (after they have been verified) on top of an exclusive two down line referral level of points earning. Not only can you earn from the members you refer, but you can also earn a percentage on your referral down line! User 'A' has joined WTH and rewarded with 100 points as a sign up bonus. If 'A' has used an existing member ID as reference while joining, 'A' will get 150 points instead. Once 'A' has joined, he/she can refer someone (like their friends, family members, ..) to earn more points. e.g. 'A' as member invites someone 'B' for joining. Once 'B' has joined..
'A' will have 150 (for being a referred member) + 50 (for referring 'B') = 200 points. Next if your referred member has invited someone to join, you still will get reward points as added benefit. e.g. Member 'B' invites another user 'C' for joining. Once 'C' has joined..
'A' will have 200 (from level 1) + 5 (Referral bonus as 'C' was referred by 'B') = 205 points. Bonus points are offered to our users from time to time based on random selection, surveys, feedback, loyalty based (conduct and behavior), based on the engagement history, contribution, spreading the word and more. Climb the reward points leaderboard for your chance to win high/frequent bonus points. The more you share or contribute, the higher you can climb and have a better chance of earning bonus points. 4. Redeem Your Points - What are the points worth? Following is the breakdown of how you can redeem your points. 10000 points = Deposit $10 in your PayPal Account. Buy Ad Spots You can also use your points in Buying Ad Spots depends upon where you want to place your ad. How do I earn points (details) ? You can use WTH Reward Points at any time. WTH Points may expire after 1 years of no points activity in your WTH account. All these points and rewards are non-transferable. If you attempted to manipulate the system, your account will be banned.